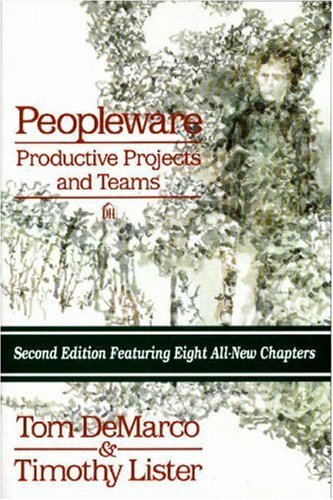 Book Review – Peopleware – Software is too expensive to build cheaply…. It is one of my all time favourite books – a true timeless classic that really should be mandatory reading for every knowledge worker. I have both the first and second editions on my reading list, so I can do a two-fer and review them both at once. I bought the first edition in a 2nd-hand bookstore for $15 – the price is still on the inside cover. Two days later, I ordered the second edition for the eight all-new chapters. Overall, the book holds its age well – it’s nearly 25 years old now, as it was first published in 1987. If they release a ’25th anniversary’ edition, do pick it up. The Right People – covers how important it is to get the right people for your environment, not necessarily the most skilled or the cheapest. Growing Productive Teams – pretty obvious; this is about how you nurture teams, how you can help make them gel, and how you prevent them falling apart. It’s Supposed To Be Fun To Work Here – enjoyment and satisfaction in the work environment – what a novel idea! Son of Peopleware – a reflection on the 12 years between the two editions, lessons learnt and new insights. It’s a little dated in some ways. Some of the specific problems described in the book have gone away or reduced, while some of the specific solutions aren’t quite right anymore. But as a whole, the book is still highly relevant. Each section is broken into several chapters. In the first part of the book, each chapter focuses on a particular issue. That may be a common negative phenomenon or anti-pattern – Chapter 3 is about overtime and workaholics, while Chapter 7 is about issues with ‘The Furniture Police’ – the people who don’t let you re-arrange workspaces to enable greater collaboration. Or it may be a positive workplace practise, such as Chapter 21 ‘A Spaghetti Dinner’, which describes a simple team-building exercise and why it works. Each chapter is short and focused – any chapter can be read in just a few minutes, which makes this a great book to read in spurts. Managers jeopardise product quality by setting unreachable deadlines. They don’t think about their action in such terms; they tink rather that what they’re doing is throwing down an interesting challenge to their works, something to help them strive for excellence. Allowing the standard of quality to be set by the buyer, rather than the builder, is what we call the flight from excellence. A market-derived quality standard seems to make good sense on as long as you ignore the effects on the builder’s attitude and effectiveness. In other words, good people want to build good products that they are proud of. Having worked in more than one environment where building good products was always a struggle, this is a principle I can agree with at a gut level. The book does have some gaps. In particular, it assumes that knowledge workers should work alone or in pairs, even when part of a collaborative team – this runs counter to some of the various Agile methodologies I’m a fan of, which put emphasis on the benefits of a co-located team working in a communal area. That said, there is little in this book I disagree with, and a lot that I’m in violent agreement with. If I could make any manager I report to read just one book, it would be this one. If I could make them read a dozen, this would be the first – closely followed by several others by the same authors (“Slack”, by deMarco, is another favourite). It doesn’t matter that some of the advice in this book is 25 years old – it’s still important.